7/15 Update: Tonight my boyfriend and I found ourselves with an excess of ice cream and a craving for a brownie sundae type of dessert. 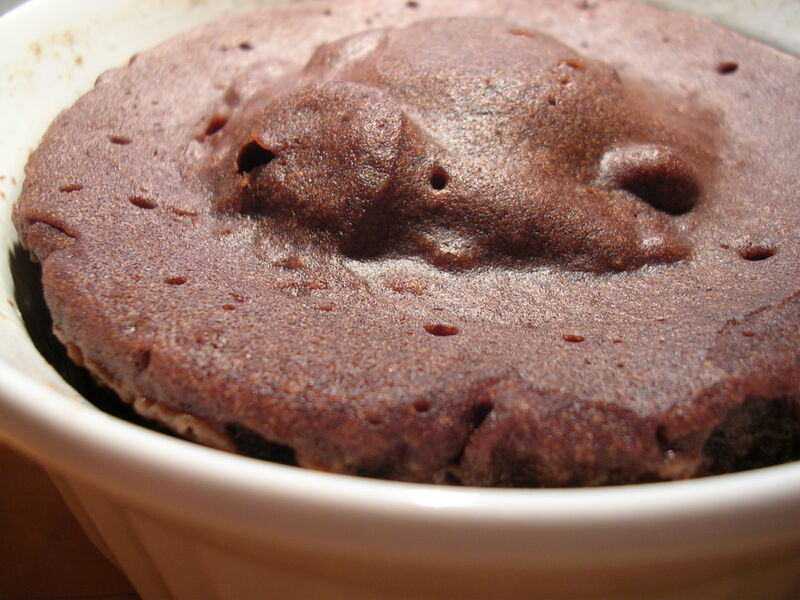 I was too lazy to go down to the country kitchen in my dorm to whip up anything, but I did remember my little microwave chocolate cake recipe… so I tweaked it a bit and it came out wonderfully this time! Figures that my camera batteries were dead, but I just had to write it down for future reference. I started off melting the usual ounce of unsweetened chocolate, and while doing that I stirred together the butter with about 1/2 cup of sugar instead of the 1/5 I used before (remember, last time it came out not sweet enough). 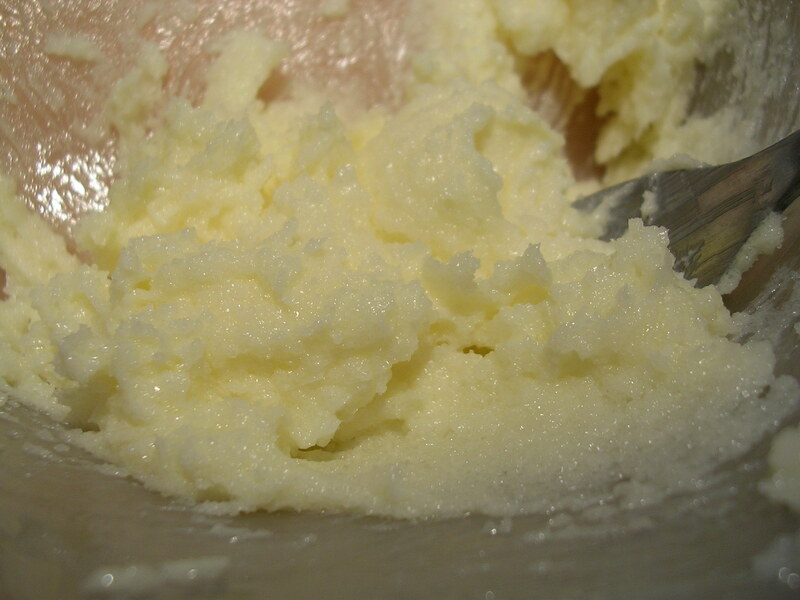 I also didn't soften the butter at all, so the consistency of the creamed butter was not whipped in any way. Then I threw in the egg and whipped up the batter a little bit while stirring in the egg. I figured having some air in the batter would be a good thing to make the cake less dense this time around. In went the melted chocolate, and then instead of using instant coffee, that made the cake bitter last time, I went with a heaping tablespoon of Swiss Miss hot chocolate mix. I figured that would do the trick and sweeten up the cake. Finally I added the 1/4 cup flour, the salt and baking powder, and then I realized that I had no milk! So to remedy this problem, I threw in a few spoonfuls of the vanilla ice cream I had in the freezer. I figured that it would melt into a milk/cream liquid anyway. The batter this time wasn't shiny like it was last time. It was more matte, probably because it had more air and sugar in it. Put it in my large ramekin, greased with butter instead of oil spray this time, covered with saran wrap as before, and cooked it still for 3.5 minutes on high. I watched it puff up in the microwave, and it was really interesting to watch the cake balloon upwards and conform to the size allowed by the saran wrap. I was a little afraid it would explode, but it deflated quickly when the microwave was stopped. In fact, the cake came up exactly to the rim of the ramekin when I had taken it out of the microwave. 1. 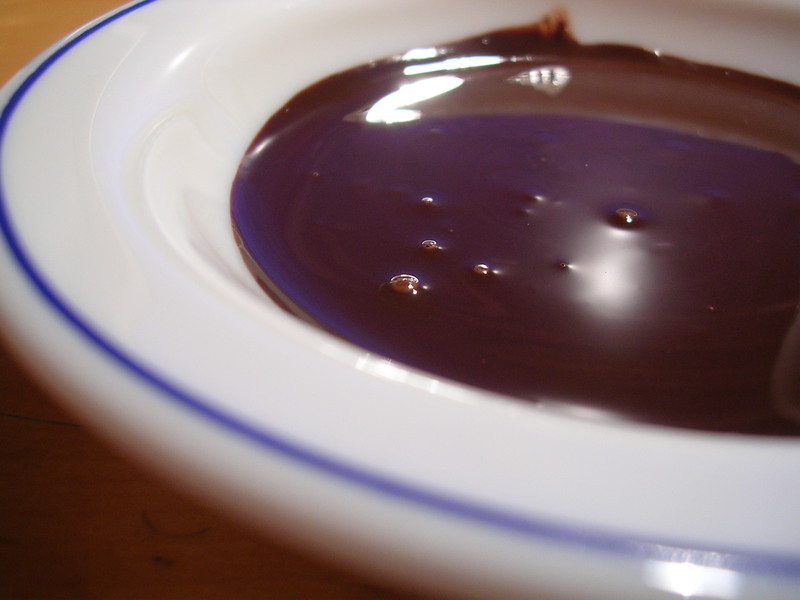 Melt the chocolate in a microwave-safe bowl. 1 oz. 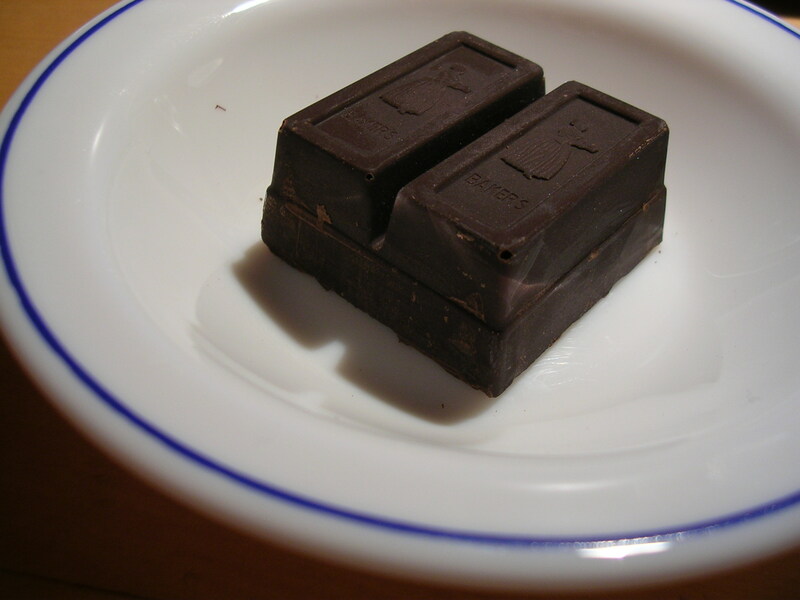 of Baker's chocolate can be melted in the microwave on high for 1 minute, stirring briefly after 30 seconds and then again after 1 minute until chocolate is smooth and melted. Allow to cool briefly while continuing. 2. In another bowl, beat butter and sugar until fluffy and pale. I had no electric mixer on hand, so I did it with a good ol fashioned fork. 3. Add the eggs, then the cocoa (or in my case, the instant coffee) to the sugar and butter mixture. Continue beating. 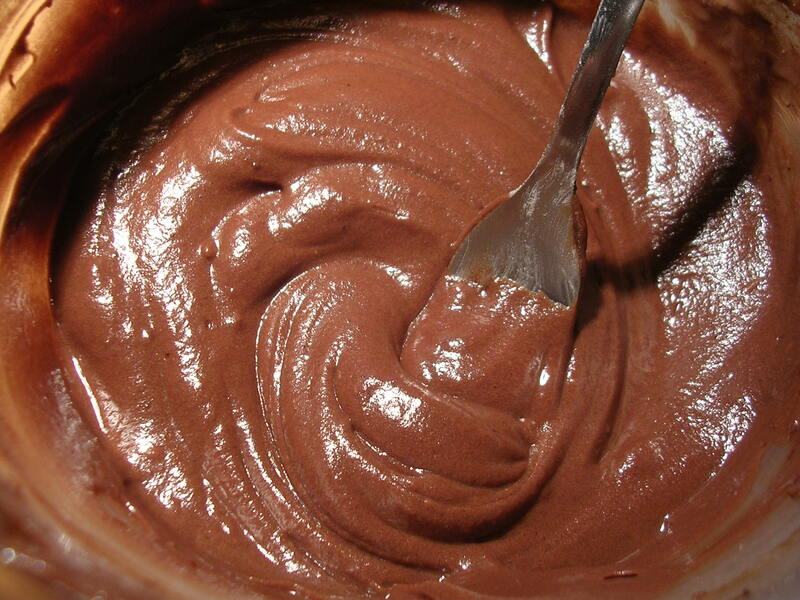 Stir in the melted chocolate and 2 tbsp of sugar, then gradually add the flour, baking powder, salt and milk. 4. 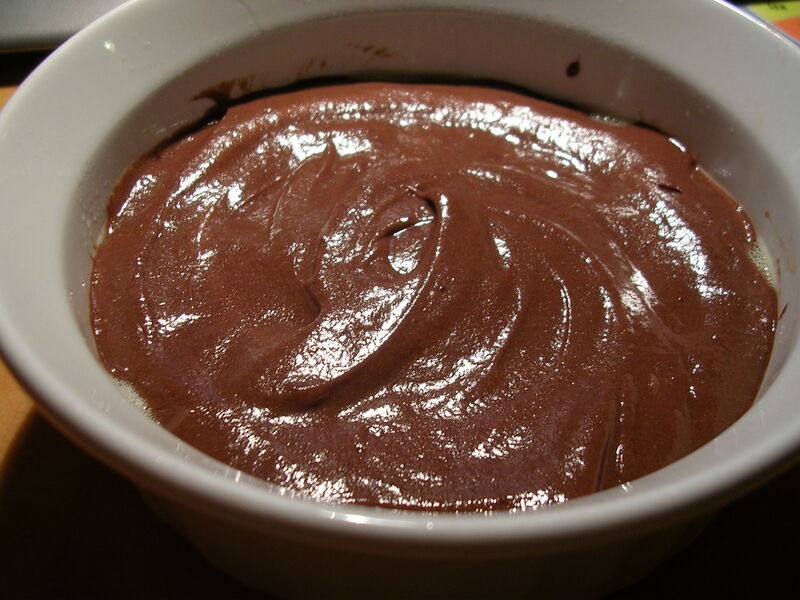 Butter up a microwave-safe pudding mold, cereal bowl, silicone flexiforms, or, as I resorted to, a Corningware 16 oz. ramekin that was 4" in diameter. Fill with batter, then cover with cling film. Pierce the film with a toothpick in several places. Cook in microwave on high for 3 minutes at 700 Watts (3.5 minutes if using 600 Watt microwave, which I had.) Leave to stand for 2 minutes, unmold onto a plate and serve immediately topped with confectioners sugar or whipped cream. Once I inverted the cake, I realized that the bottom of the cake had lots of nooks and crannies that were a bit ugly for the surface of a cute little cake. In hind sight, I believe that this was probably caused by my use of a cooking spray instead of actually greasing the ramekin. 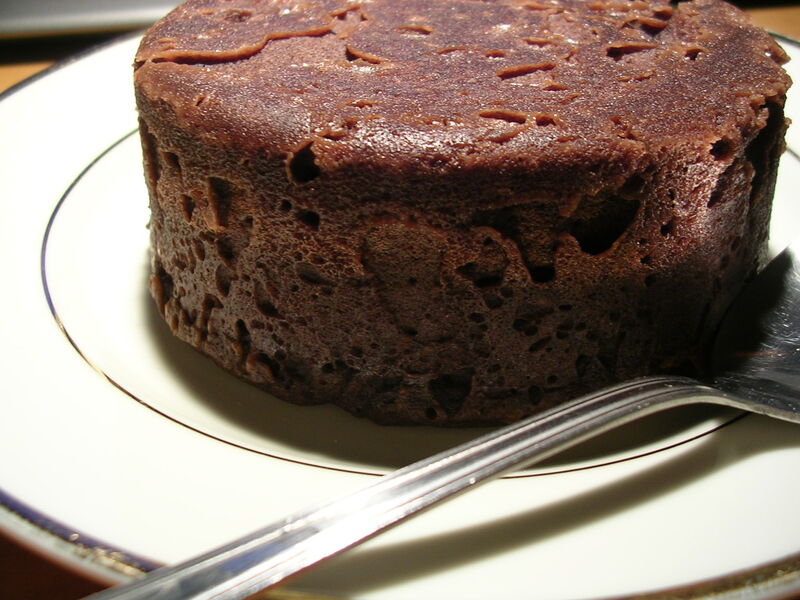 The spray left a liquid layer that probably boiled in the microwave, forming pockets of air and leaving behind those hideous pockmarks on the surface of the cake. So next time use real butter to grease the container! But still, I wasn't too worried about its appearance, the taste is what's most important! I had no whipped cream, so I just dusted the top with confectioner's sugar to distract the eye from the uneven cake surface. I think it more or less did the trick. Now, the taste. I will not sit here and pretend it was the most glorious piece of cake that has ever touched my lips. It IS microwaved chocolate cake after all. Like I said, it had no fudginess or chewiness, which some people may want. 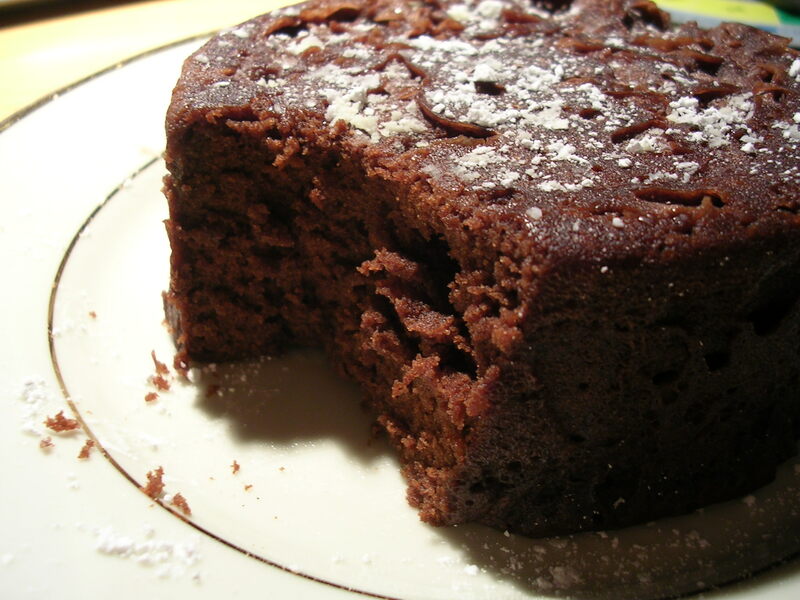 It is more or less a satisfying and quick chocolate cake that is surprsingly moist and soft, full of chocolate flavor. The cake wasn't dense or too rich, which I thought was a nice change from some chocolate cakes I encounter. It could have used more sugar in my opinion, but I also believe that using instant coffee instead of baking cocoa probably made the cake more bitter than it was intended to be. Tweak at your own risk :) In the end though, I had a great time making and eating the cake (I washed down half the cake with a nice glass of milk, and saved the rest for the next day), and it's definitely a fun recipe to try just for the heck of it when you are bored and in the mood for a chocolate cake :) I think it would have been perfect with a small scoop of vanilla ice cream, or topped with some hot fudge and whipped cream. Haha well then it would have been sort of like a brownie sundae, except with a lighter chocolate cake instead. This cake is also the perfect size for sharing, as half a cake for a person is plenty. 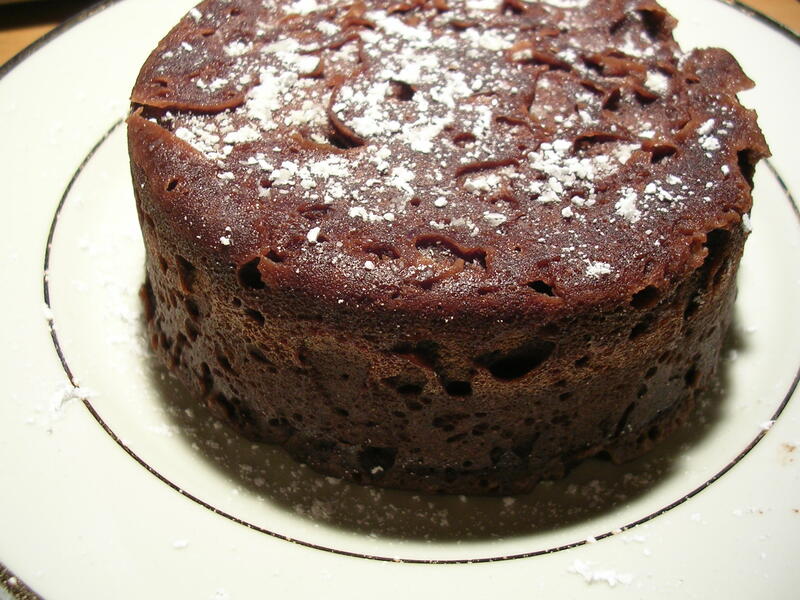 This entry was posted on Monday, July 9th, 2007 at 6:06 am	and posted in baking, desserts, recipes, Uncategorized. You can follow any responses to this entry through the RSS 2.0 feed. « Summer vacation is in full swing!